When I read last Friday evening that most, if not all, of the global strategic maple syrup reserve had been stolen, my first response was not to fear for North America’s waffles or pancakes, but rather to wonder at the very existence of such a reserve. After all, the terms “global,” “strategic,” and “reserve,” are more often used with respect to petroleum, currency, or the smallpox vaccine than waffle-toppers. 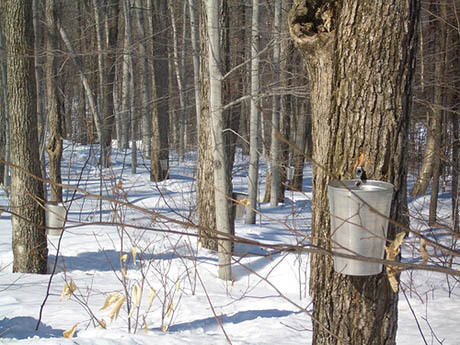 IMAGE: Maple tapping in Quebec, via. IMAGE: The International Strategic Syrup Reserve, photographed in 2011 by Francis Vachon for The Globe and Mail. In other words, Canada’s (former) syrup stockpile is maintained for the benefit of maple tappers, rather than as a global breakfast insurance policy. In that respect, it is more like the EU’s legendary, and recurring, wine lakes and butter mountains — the result of surplus production, deliberately held back to prevent market volatility. 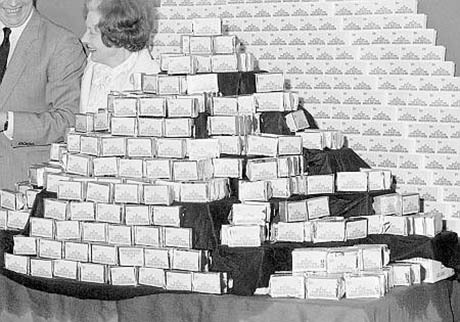 IMAGE: A symbolic EEC surplus butter mountain photographed at a British Labour Party Gala Morning in 1984, via. 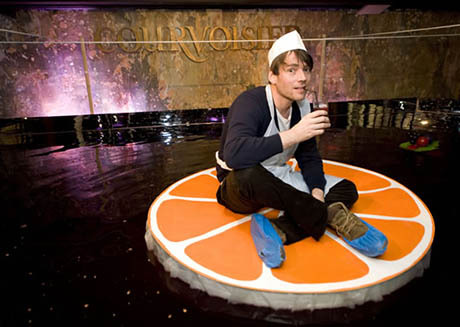 IMAGE: Alex James floating on culinary magicians’ Bompas & Parr’s lake of punch, via. But while the EU’s amusingly-named surplus storage is the outgrowth of a protectionist quota system, and Quebec’s rather endearing maple syrup stocks form part of an industry-sponsored strategic growth strategy, globally, a growing number of policy experts are calling for the establishment of food reserves as a vital safety net for the hungry consumer. 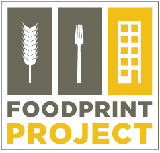 As Foodprint Toronto panelist Evan Fraser explained in his 2010 book, Empires of Food: Feast, Famine, and the Rise and Fall of Civilizations, co-authored with Andrew Rimas, food reserves are actually one of the oldest food security strategies in the book. He is fond of reminding policymakers of the Old Testament story of Joseph, the Pharoah, and the seven skinny cows eating the seven fat cows, as a demonstration of the value of saving food in years of plenty, in order to sustain the populace during the inevitable lean ones. 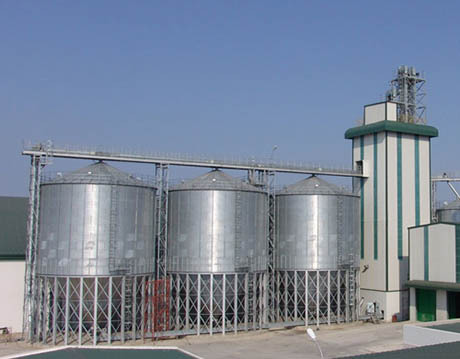 IMAGE: Steel silos in China, used for oil and grain storage, via. These kinds of reserves — a national stockpile held to ensure food security in the event of an emergency — used to be commonplace, but have largely disappeared in the last twenty years. The U.S. eliminated its last grain reserves in the 1996 “Freedom to Farm” Act, while a U.N.-led effort to establish a network of grain reserves in developing nations following food price spikes in the 1970s fizzled out a decade later in an embarrassing combination of corruption, price fixing, and pest damage, as well as the new orthodoxy of free market efficiency. Since then, the reigning assumption has been that global trade can distribute harvests more efficiently than human design. This may be, but we still live in a world where one billion people are hungry and an equal number are overweight or obese, while more than a billion tons of food are wasted each year. What’s more, reserves are expensive to maintain, and countries that could afford them can usually import their way out of shortages instead. Poor countries, on the other hand, can’t afford either, leaving them extremely vulnerable when harvests fail and food prices rise. 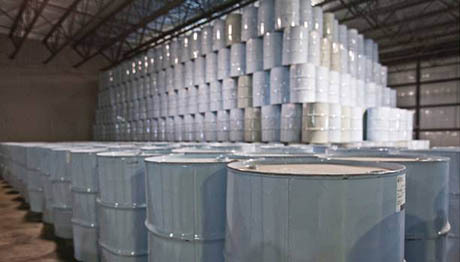 For example, a 2011 Food and Agriculture Organization report on the world food crisis of 2007 and 2008, in which a shortfall was caused by a combination of droughts and high oil prices (and exacerbated by a host of other hotly disputed factors, including the rise of biofuels), noted that the resulting price spikes caused an 8 percent increase in the number of malnourished people in Africa. 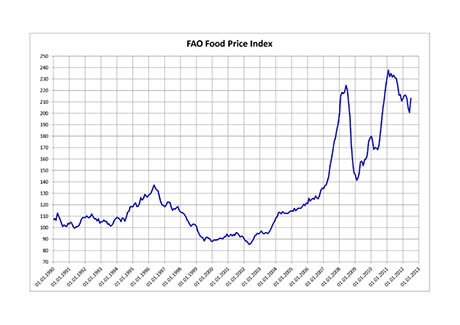 IMAGE: Food price index charted from 1990 to the present, via. In an era of climate change, which means disruptive weather and increasingly variable harvests, food prices are predicted to remain volatile and high. In addition to all the aspects of a balanced food security strategy (reducing waste, increasing harvests, improving water storage and transportation infrastructure, and so on), a growing chorus of think tank papers and op-eds are arguing in favour of re-establishing some kind of food reserve system. 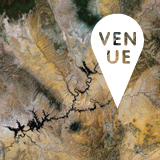 This presents a fascinating design challenge, in terms of physical infrastructure and architecture, as well as operations, economics, and geopolitics. 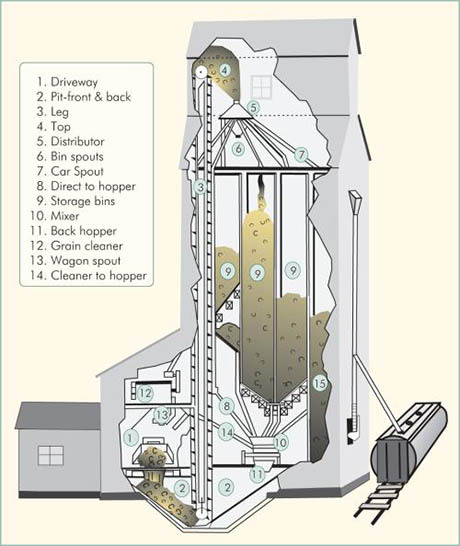 IMAGE: Grain elevator cutaway, via the Canadian Plains Research Center. In their proposal, the U.N., World Bank, or similar international institution would be responsible for managing a “fund,” consisting of dollar commitments from grain-producing countries that together add up to between 30 to 50 percent of normal grain trade volume. If grain prices started to rise above a certain agreed-upon point, the fund could call in those commitments in order to execute a series of short sales on the futures market, which would, in theory, bring spot prices down and drive speculators out. 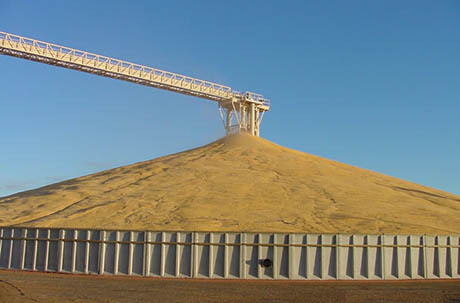 IMAGE: Grain bunker built over grain reclaim tunnels, via Hanson Silo. Siting a national food reserve is also not straightforward, depending on internal transportation infrastructure and how the country is connected to either local or global markets. Regional reserves, such as East Asia’s Emergency Rice Reserve, are almost inevitably distributed in their member country’s national storage facilities for political reasons as well as efficiency. 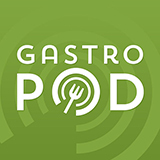 But perhaps the most challenging aspect of food reserve design is managing it: preventing loss from pests, heat, theft, or mould, rotating stock to keep it fresh, maintaining volume, and planning for distribution. 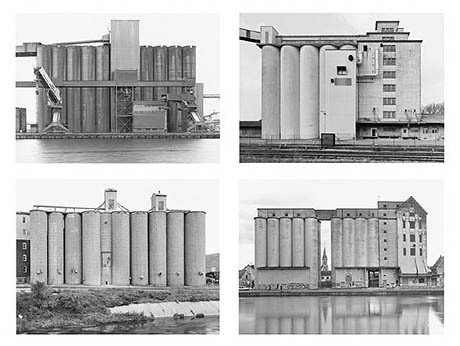 IMAGE: Grain elevators, Bernd and Hiller Becher, via. The infrastructure of bulk food storage has hardly evolved from the concrete cylinders so admired by Le Corbusier at the start of the twentieth-century; the time thus seems right to imagine a new networked architecture, both functional and monumental, circulating, cooling, and protecting its contents through a series of suction aeration fans, gravity-fed conveyor belts, temperature and moisture sensors, pneumatic dust suppression systems, floor perforations, partitions, chutes, pressurised seals, and more. 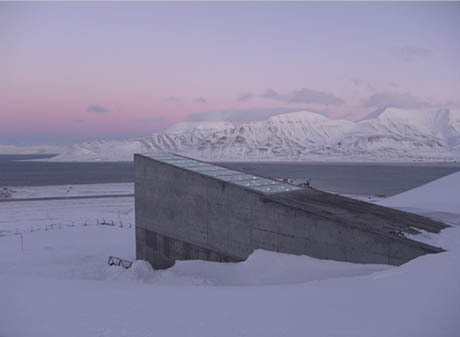 IMAGE: Svalbard Global Seed Vault, photographed by Mari Tefre, via. IMAGE: Svalbard Global Seed Vault, drawing by The Directorate of Public Construction and Property, via. A strategic food reserve could save your life someday. There are growing warming signs that an abrupt climate change (ACC) event is on its way. Instead of burning our extra corn we could process it into sugar and syrup and easily store that like we do with the strategic petroleum reserve. This may seem like a funny idea, but the true risks facing the planet and the US today are higher then ever. Global food stockpiles are at very low levels as of this time (November 2012) as a result of global drought and rot damage. We could easily see a continuation of the trend in declining global food production per capita – which would increasingly make starting a strategic food reserve difficult. Ultimately, global population needs to decline to alleviate the risks and potential downside risks. Otherwise, if global warming continues at its pace of the past few decades, we might be seeing massive global famines in the coming decades. Thanks, et. I agree: it’s entirely possible to be overweight and malnourished, but perhaps harder to be overweight and hungry (by which I mean undernourished). The juxtaposition seems fair, given that most of the billion overweight are in the developed world, and most of the billion hungry live in developing countries. Why do you juxtapose: one billion people are hungry and an equal number are overweight or obese? It is entirely possible to be overweight and malnourished. You had me at “global strategic maple syrup reserve.” Fantastic blog! Blown away by your posts.